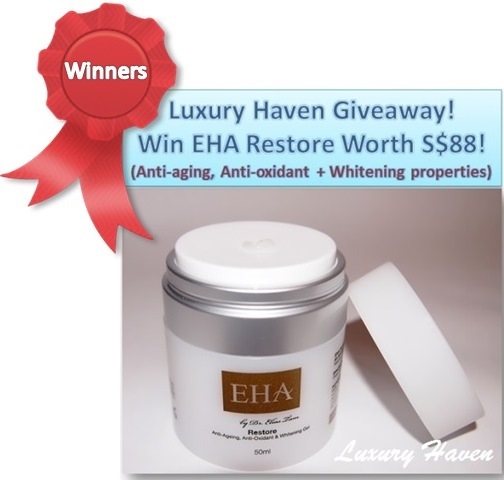 EHA Skincare Gentle Exfoliating Gel Giveaway Winners! Made in Japan, it reduces pigmentation and skin discoloration while maximizing your skinʼs ability to absorb the beneficial nutrients of your skin care and prepare skin for treatment by stripping away old keratin, gently and effectively. 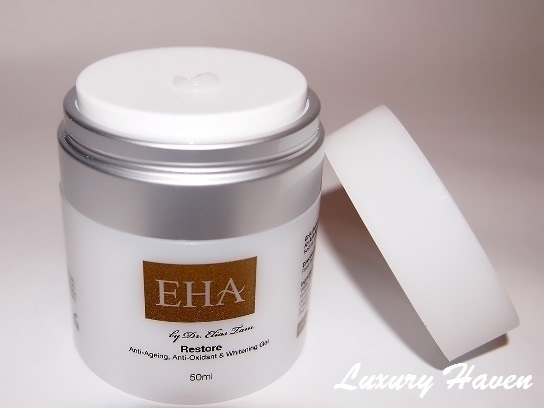 Doesn't the EHA Gentle Exfoliating Gel sound like a great product? Now, are you one of the lucky 5 to walk away with a bottle retailing at SGD 68? 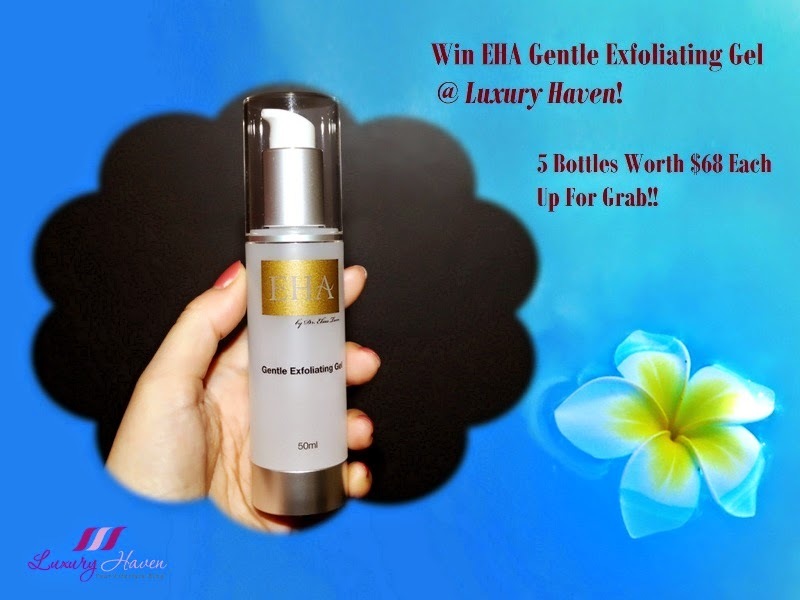 EHA Gentle Exfoliating Gel Giveaway: 5 Bottles to Win! Need an exfoliating product for your face that that gives you effective results yet gentle on your skin? With ingredients like Evening Primrose oil for its antioxidant and whitening properties, Algae extract for its moisturizing and whitening properties and Glycerin for its hydrating properties, skin looks brighter and cleaner without any greasy after-feel. 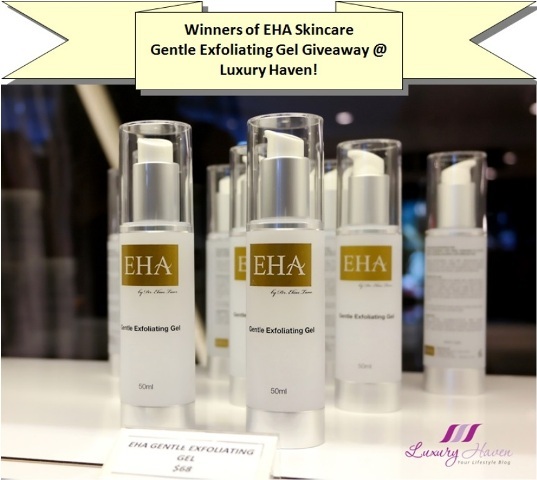 Luxury Haven is collaborating with EHA Skincare to reward 5 of our readers with the EHA Gentle Exfoliating Gel Worth SGD 68 each! 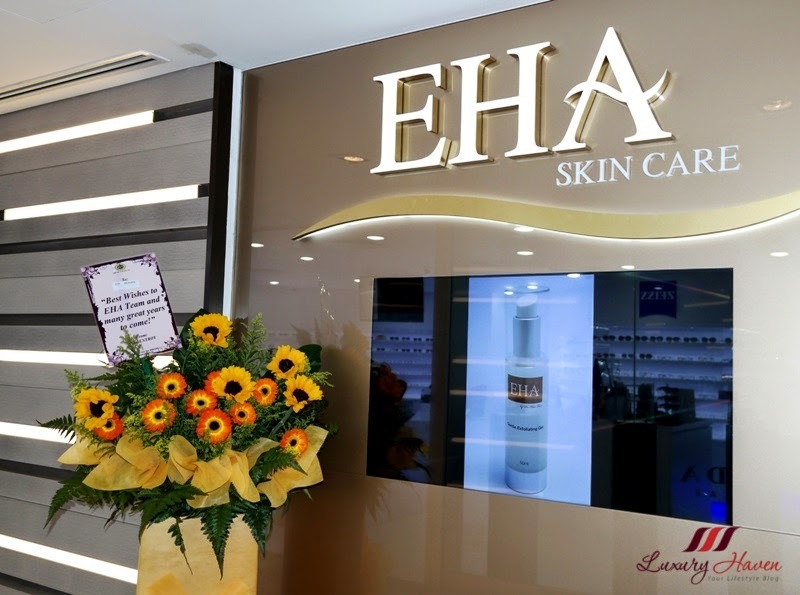 With a range of skin care products from Japan, US and France, beauty junkies will now be able to indulge in EHA Skincare with their newly-launched boutique located at Shaw Centre, right in the heart of Orchard Road! 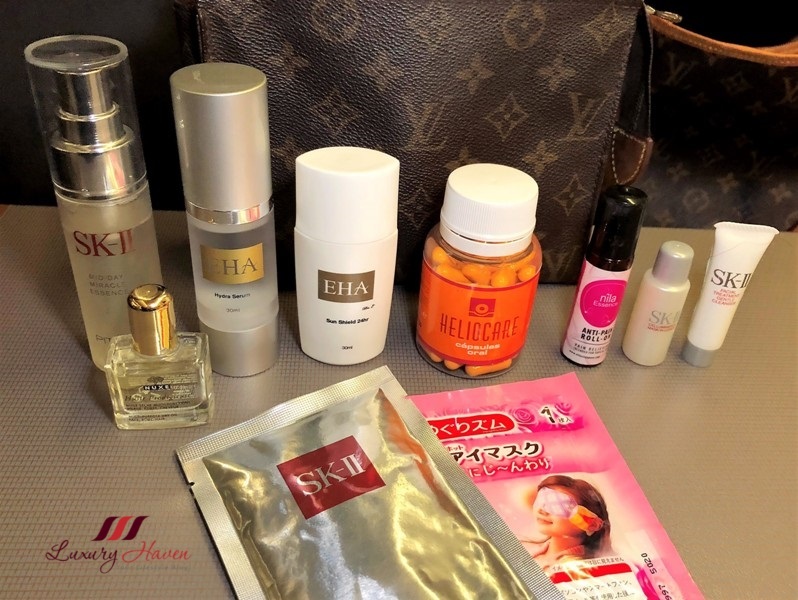 Besides a comprehensive range of skin care specially formulated for the humidity of Asia and sensitive Asian skin, here's introducing some of EHA Skincare’s products made in Japan including their best sellers. 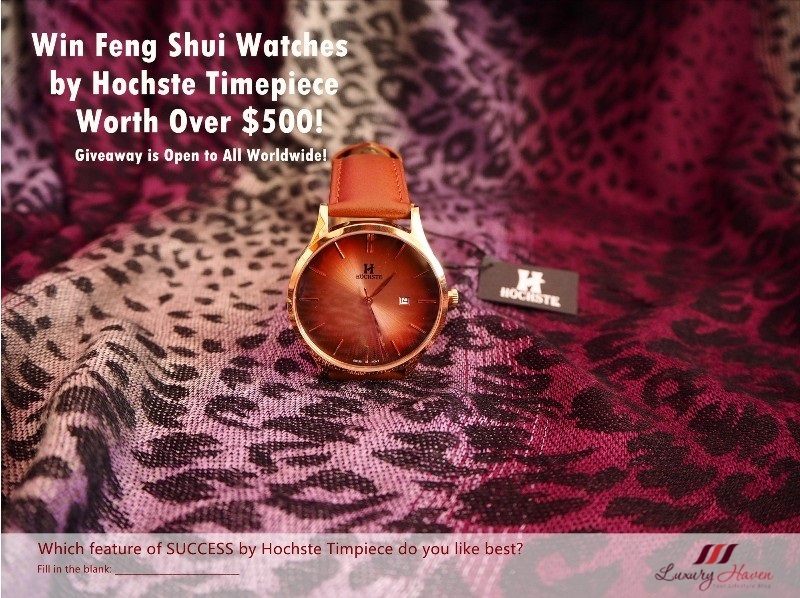 5 Aesthetic Tips For Looking Fabulous This Chinese New Year! Your face and body deserve more than you think, Sunshine. This Chinese New Year, get flawless-looking skin coupled with a fabulous figure to go with your body-hugging Cheong Sam or Qipao! Yes, yes, yes, it's working for me! I'm amazed that in just 1 treatment of CoolSculpting, a vast difference is seen in just a month! I'm in my late 40s, and blessed with relatively good skin. 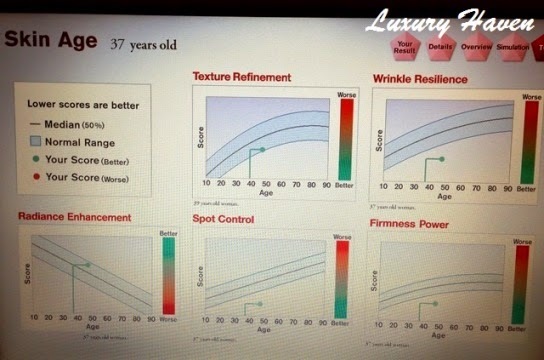 Many have commended that my complexion is flawless, and in one of the SK-II Magic Ring skin tests done some time ago, my skin age is standing at just 37 years old even though I'm already going 49! The truth is, you would notice fine lines especially around my eyes and forehead plus some pigmentation on my face if you look closely. Of course, there are over-the-counter beauty products to counter these concerns, but it seems only surgical and energy based treatments are able to provide an effective way to treat wrinkles for long term results. 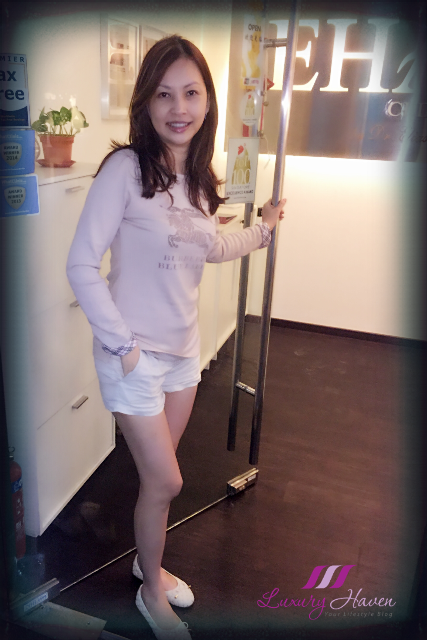 EHA Clinic Transforms Me Into Snow White With ReFirme ST! 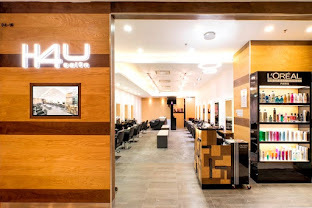 How does having a complete Anti-Ageing Solution in just 2 hours sound to you? What would you say to having a more youthful, luminous and firmer appearance with no downtime at all? As we aged, our skin begins to lose elasticity. 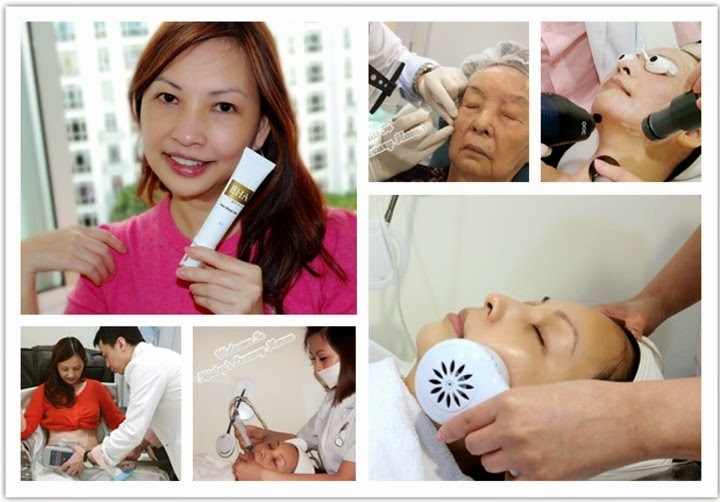 So when I heard of the ReFirme™ ST Therapy which is able to stimulate collagen production without any pain, I was sold! Winners Of EHA Restore Worth SGD88 By Dr Elias Tam!! 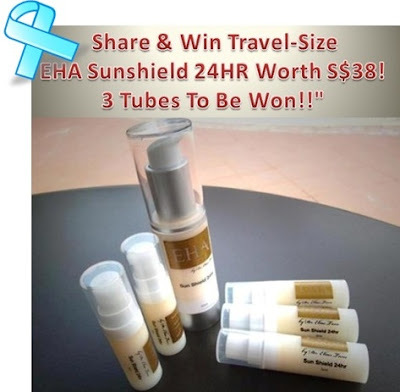 Drum roll for the 2 lucky winners of Restore, EHA Clinic’s latest product by Dr. Elias Tam! I'm really thankful for the modern day technologies in maintaining a youthful look without the need of going under the knife. Gosh, I hate my double-chin! Recently, I was introduced to NIR, a non-invasive method to treat sagging skin to tighten & re-contour at the EHA Clinic. Count ourselves lucky living in the world of technologies. With the invention of lasers, rising numbers of people are keen in improving the appearance of their damaged skin. We can easily remove unwanted scars, pigmentation, unsightly hairs & more, with technologies that revolutionized the aesthetic market. 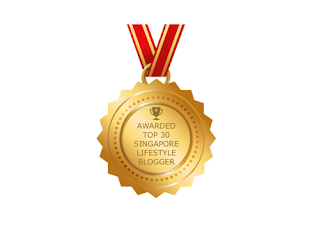 IPL/Laser For Pigmentation At EHA Clinic + Giveaway! Brown spots, Freckles, Melasma, Old Age Spots......... Don't you hate them all? Pigmentation creams are probably the first stop for any hyperpigmentation concerns. 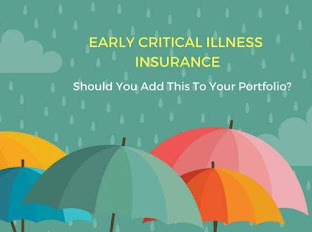 They are easy on the pocket, convenient & easily available. But if creams don't work or if you want a faster way out, IPL or Laser is another alternative to get rid of those ugly dark spots. Hyperpigmentation removal takes only minutes with laser & in one or few sessions, you're done! Our skin changes as we age. It becomes thinner, loses fat, & no longer looks as plump & smooth as it once did. I'm glad to have discovered the Restylane Dermal Fillers, designed to effectively reduce the appearance of unwanted wrinkles, contour & create volume. Mom had saggy cheeks. I mean, who wouldn't at her age? So I decided to take my mom to EHA Clinic & Skincare to consult Dr Elias Tam, a respected & reputable Aesthetic Doctor, who had suggested Fillers for my mom's cheeks to pump up the volume there. 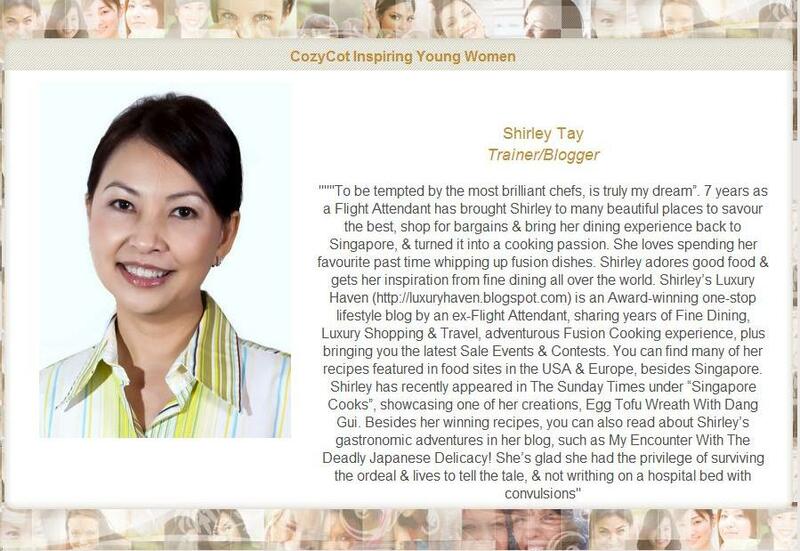 Announcing The Winner Of EHA Mother’s Day Giveaway! 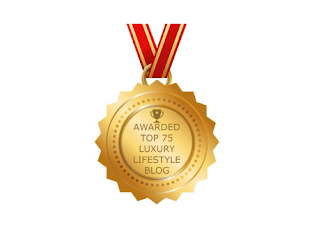 First & foremost, thank you for participating in the above Giveaway & a warm welcome to those who have just joined us at Luxury Haven. It's really nice seeing all your wonderful comments & I do hope to see you more often here. 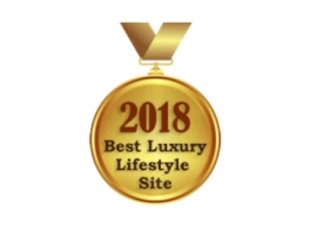 Be sure to subscribe to our free newsletter via email etc if you haven't, to stay updated with the latest recipes, travel & shopping news, product/dining reviews, promos/contests & more. 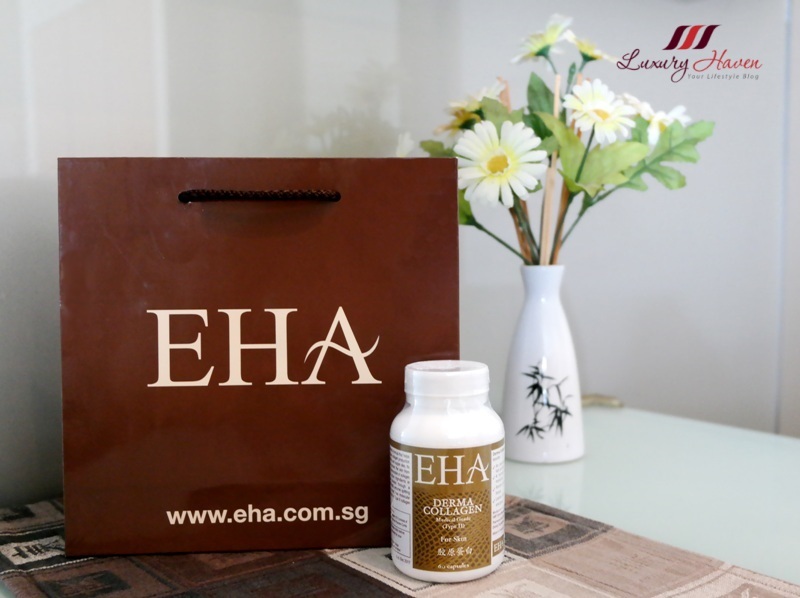 Well, it’s time to announce the 2 lucky winners for Luxury Haven's Mother’s Day Giveaway: EHA Facial & Skincare Products! Are you the lucky one? 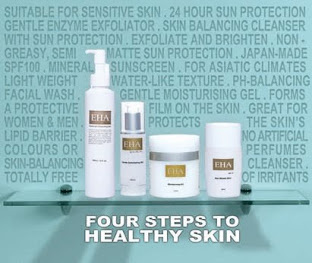 EHA Clinic & Skincare Product Review You Mustn’t Miss! Following my Skin Awakening Facial At EHA Clinic & Skincare, I’m back introducing their range of amazing skincare products.